Berlin: Prime Minister Narendra Modi on Monday described terrorism as the "gravest challenge" facing humanity and urged Europe to play a lead role in developing an effective global response under the aegis of the United Nations (UN) to deal with this menace. Modi, who arrived in Berlin on the first leg of his six-day, four-nation tour of Germany, Spain, Russia and France, in an interview to German newspaper Handelsblatt said, "Europe has been hit hard by terrorism". "To our mind, terrorism is the gravest challenge facing humanity. Europe must play a lead role in developing an effective global response under the aegis of the United Nations to deal with this menace," he said. 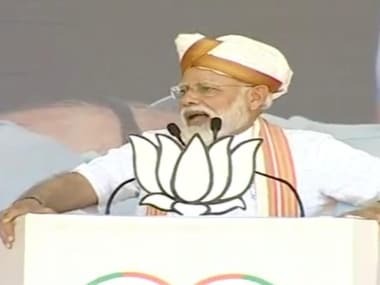 Modi's remarks assume significance as they come in the wake of a spate of terror attacks that have struck European countries like Germany, France, the UK and Sweden recently. The latest terror attack to have rocked Europe was at a concert in Manchester where a suicide bomber blew himself up, killing 22 people. 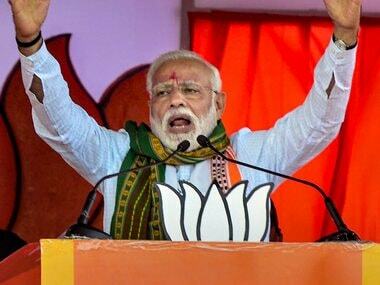 Speaking to the country's leading business daily, Modi struck a warning note against moves towards protectionism and called for Europe to ensure that the global economy "remains open for international trade and free flow of investment and people". "We do have concerns regarding protectionist and anti-immigrant sentiments in the world. We are hopeful that they will be addressed," Modi said. "We live in an interconnected world. Movement of goods, capital and people across borders is essential to our collective progress and to realise the benefits of globalisation," he said. Modi stressed the importance of India to Germany, stating that it was as among the "most open" and "fastest growing major economies in the world". The prime minister also called for reform of the international order to reflect current day global realities rather than the global bodies created in the aftermath of the World War. "India has been seeking reform of the UN Security Council for quite some time...There is an urgent need to expand the Security Council," he said, adding that India has all the credentials to become a permanent member in an expanded Security Council. On the India-German ties, he said India sees Germany as an important partner in the national flagship programmes of Make in India, Skill India, Start-up India, Clean India and Smart Cities. In reference to the wider European Union (EU) and Britain's impending exit, he said, "The European Union is an important global player. 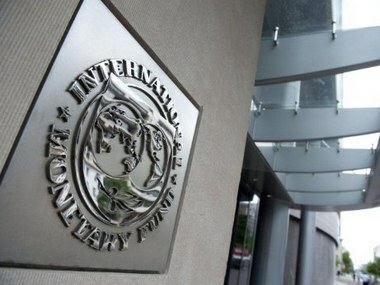 Its stability has a significant bearing on global developments, including peace and security. "India values its strong and multi-faceted relationship with both the United Kingdom and the European Union and is committed to further strengthening its ties with both the strategic partners. We will continue this approach." On the German side, Merkel had recently said, "The times when we could rely on the other have passed ... We Europeans, we must really take destiny into their own hands." In India and China, Merkel sees the possibility of a partnership that would help slow down climate change and promote free trade, Handelsblatt claimed. The prime minister's visit to Germany has been described as a "new chapter" in the bilateral relations between the two countries. "I am confident that this visit will open a new chapter in our bilateral cooperation with Germany and further deepen our strategic partnership," Modi had said in a Facebook post on the eve of his visit. 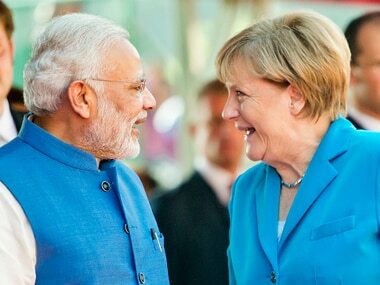 "Germany is a valuable partner in our development initiatives and German competencies fit well with my vision for India's transformation," he said. The prime minister said he and Merkel plan to "chart out a future roadmap of cooperation with focus on trade and investment, security and counter-terrorism, innovation and science and technology, skill development, urban infrastructure, railways and civil aviation, clean energy, development cooperation, health and alternative medicine". Bilateral trade between the two countries stands at €17.42 billion euros in 2016, up only marginally from 17.33 billion euros the previous year. Germany is the seventh largest foreign direct investor (FDI) in India and the total FDI from April 2000 until December 2016 amounted to $9.54 billion. 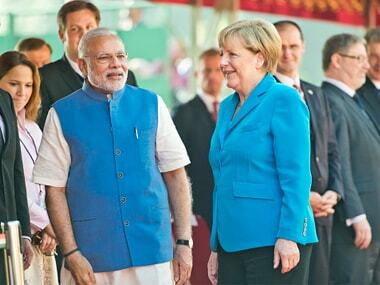 A total of 1,800 German companies are operating in India.